I am presently reading author John Kruth’s biography of legendary Texas singer-songwriter Townes Van Zandt entitled To Live’s to Fly: The Ballad of the Late, Great Townes Van Zandt. If you’re at all familiar with Townes you may well know some of the details of his life, and how such events scarred the artist, and eventually intertwined themselves into the core of his creativity and music. So far, To Live’s To Fly is a decent look into Townes time on this earth as witnessed by friends, colleagues and contemporaries. Essential Viewing: If you consider yourself a Townes fan, and have not yet seen the documentary Be Here To Love Me, you’ll want to get on that asap. Director Margret Brown paints a thorough, yet heartbreaking, look into the life and work of Townes music. 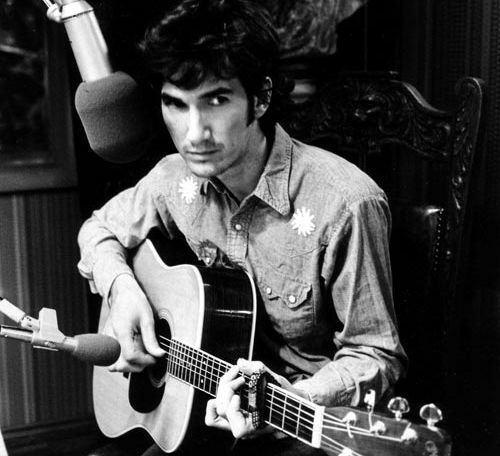 + Download Townes Van Zandt through eMusic’s 25 Free MP3 offer. This clip is orignally from the film Heartworn Highways. One of the best singer/songwriters ever. I had the opportunity to see him here in Atlanta a couple years before he passed away. It was an “off” night for him, but I didn’t care. Heartworn Highways is also essential viewing. The soundtrack was recently released for the first time ever by Loose (UK) and Hacktone (US) – it’s an absolute cracker and as well as Townes has Steve Earle, Rodney Crowell, John Hiatt and Guy Clark. My dad let Van Zandt crash at his place one night after a show. I’m not sure if this was Ann Arbor or Morgantown. Van Zandt offered him one of his records in return, but I guess my dad was just tickled to have given a musical hero a roof for the night. He says he’s always wished he accepted the album; after all, Van Zandt meant his bag of records to be travel currency. I’m reading Kruth’s book right now and think it’s one of the best books about a musician I’ve ever read–and I’ve read a shitload! Such a man as Van Zandt would make for a good biography, tho, i suppose; cuz he head such an interesting life.